Satellites provide critical weather and climate data, including measurements of surface temperature, but extracting temperature information from raw satellite data requires sophisticated data-processing algorithms. 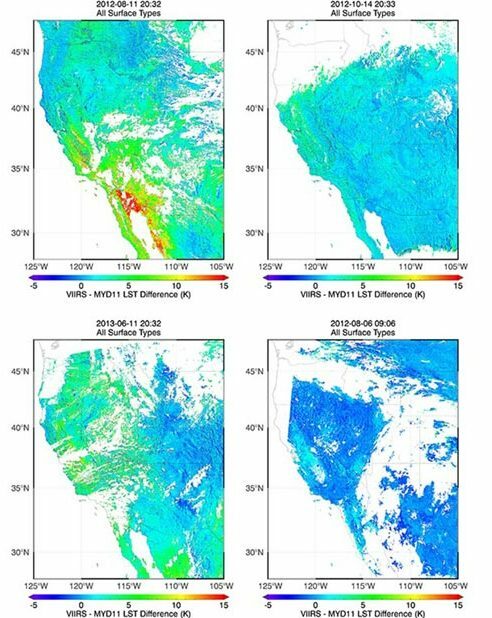 Jim Biard, CICS-NC, contributed to a recent analysis of the algorithm used to generate land surface temperature data from VIIRS (Visible Infrared Imaging Radiometer Suite) instrument on the Suomi National Polar-Orbiting Partnership (S-NPP) satellite. By comparing VIIRS results against data from both land-based instruments and the MODIS instruments on the Aqua and Terra satellites, the authors confirmed that VIIRS temperature data is in good agreement with the other sources over vegetated surfaces and over lakes and other inland water. However, they also determined that both VIIRS and MODIS significantly underestimate surface temperatures over sparsely vegetated areas, and that the VIIRS algorithm suffers from large errors (up to 15° Celsius) over areas of high atmospheric humidity.